The ”Bloody Fairy?” Gimmick or classic? Let’s explore this..
By “Bloody Fairy,” of course, I mean an absinthe equivalent of the “Bloody Mary.” Sounds simple, or so I thought. I believe the last option included here fits far better with the "Bloody" proposition and is clearly more "Fairy" related. I used this starting point on my 2018 visit to New Orleans and later at home. I now believe I am close to the perfect Bloody Fairy, loved by bars, using tweaks from famous cocktail experts, and indulging my own preferences too. It’s been a tough journey but someone had to do it! Firstly I see little need to tamper with the "Bloody" element, For bars serving very spicy or alternatively more mellow Bloody Marys, you know what works for your customers, so don’t tamper with that element. That’s what your customers want, whether it be a brunch cocktail, aperitif or even digestif (a good Bloody Mary can indeed be all of these). So I will not detail or define here the spicy tomato element of this cocktail: what works for your customers in your bar or for you at home in a Bloody Mary will work for you in a Bloody Fairy. Moving onto the absinthe element, it is clear that absinthe can be a polarising taste. While vodka can be somewhat blander. I believe less bitter absinthes work much better in this cocktail, complementing the tomato juice and the spicy elements, rather than fighting with them. For me, and the New Orleans bartenders we tried this with, Butterfly Classic Absinthe worked really well, with respectable strength (65%), little bitterness, and a flavour profile that complements tomato and spices. Butterfly has a traditional recipe base of herbs and spices which complement the spices used in Bloody Mary; it also has hints of citrus and mint that sit well alongside tomato juice. Butterfly's US heritage makes it a perfect ingredient in this Bloody Mary twist, given that the Bloody Mary may have been born at the New York Bar in Paris in 1921 or in New York itself in the 1930's, and it is certainly a cocktail which is most popular in the USA. and at Tony Seville's Pirate's Alley Café and Absinthe House (see photo with Virginia Davis at the top). We all loved it. 1. Tomato juice and all the usual spices and garnishes: exactly how you would combine them in your Bloody Mary. 2. Spirit: replace the vodka with Butterfly Absinthe, an American-style absinthe. Noting that this comes in at 65% alcohol, then you could perhaps reduce the amount of absinthe to around two-thirds of the amount of vodka you would use in a Bloody Mary. 3. The icing on the cake: float Cream Sherry on top. We hope you love this Bloody Fairy as much as we do! It is much much more than a gimmick and deserves to become a new classic cocktail. And, as it's Oscar season, I'd like to thank Bernie for all her help in New Orleans and for sharing a few Bloody Fairies! Cheers! I've posted about ladies and absinthe jokingly before, and have also highlighted the more serious role of women in making absinthe. So it was interesting to discover recently two artistic treatment of women drinking absinthe: from Paris in 1905 and from New Orleans in 2017. The first of these is probably more interesting! Gustave Poetzsch was a Swiss artist who lived from 1870 to 1950. Born in Neuchâtel, he moved to Paris to develop his painting skills. His painting of L'Élégante au verre d'absinthe may surprise absinthe historians. It seems to show a fashionable French lady drinking absinthe on her own in a Parisian café or bar. She's drinking from a glass that doesn't look like an absinthe glass and seems to be on her third drink (count the saucers used to help keep count of how many drinks a customer would need to pay for). There seems to be no stigma associated with this: she is indeed an elegant lady. Marie-Claude Delahaye has written in some detail about the painting and the unusual glass. This painting seems, in summary, to debunk the myths about absinthe in Paris at the start of the 20th century: it is a long way from "absinthism." 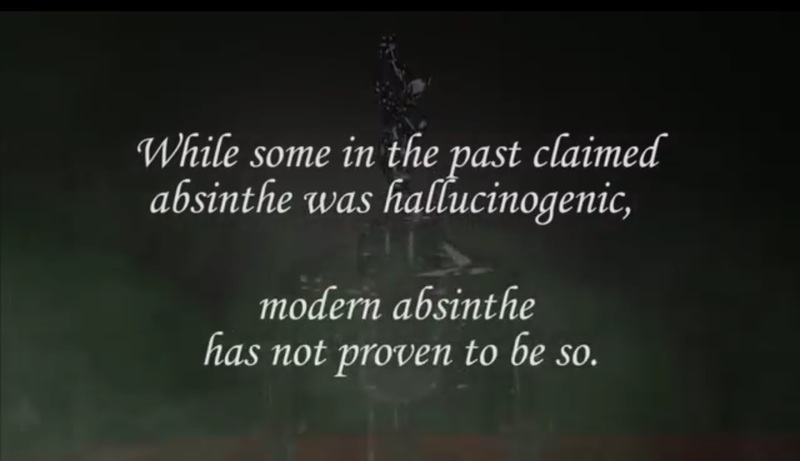 As the painting debunks myths, so Hollywood continues to spread myths about absinthe. Below I present the "absinthe" sequence from the trailer for Girls Trip. While it may be true that tourists to New Orleans enjoy drinking the Green Fairy in The Old Absinthe House and elsewhere, and some may over-indulge, they do not get the kind of absinthe effects depicted here. The most active ingredient in absinthe is alcohol. Drinking too much absinthe, and hence too much alcohol, does not lead to experiencing anything more remarkable than seeing the sidewalk (pavement) close-up. This is shared here to show how Hollywood continues to exaggerate the effects of absinthe. Something that reputable absinthe distillers will never do. 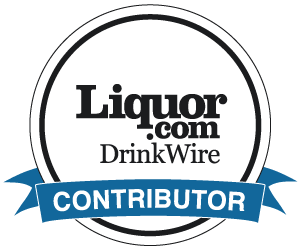 Whether you're a bartender or a consumer, we've been listening to what you say. Bartenders think that the absinthe ritual can be a nuisance when a bar is really busy. They have to get a fountain ready with chilled water, pour a measure of absinthe in a glass, maybe put a spoon with a sugar lump on the glass, position it correctly and drip the water. And then they have to wait to make sure the glass doesn't overflow! Consumers can be unsure of how much water to add, whether or not to use sugar, and sometimes they just don't want to wait for their drink! Absinthe lovers in the 19th century had the same problems. After a busy day painting (and, by the way, ingesting all those toxic paint fumes), Van Gogh really didn't want to wait for his drink. Indeed it is possible that waiting drove him mad. Literally. We hasten to add that this is the not final pack design, and we need to do some more research. Which is why we are posting this so we can ask you, whether you are a bartender or an absinthe lover a few questions. Please answer in the comments below. What is better in a bar? A can or a bottle? What is better for home use, or indeed for picnics, etc? What size? The can above is 250 ml, but maybe that is a bit big. Adding 3 parts of water to one US measure (1.5 fl oz) comes to 176 ml. If a ready-to-drink is allowed to rest for a while, you will need to shake before serving. Shake the drink, not yourself (although if you shake yourself while holding a closed drink, that might work). A see-through bottle may not look too appetising if the contents have separated, so is an opaque bottle OK? 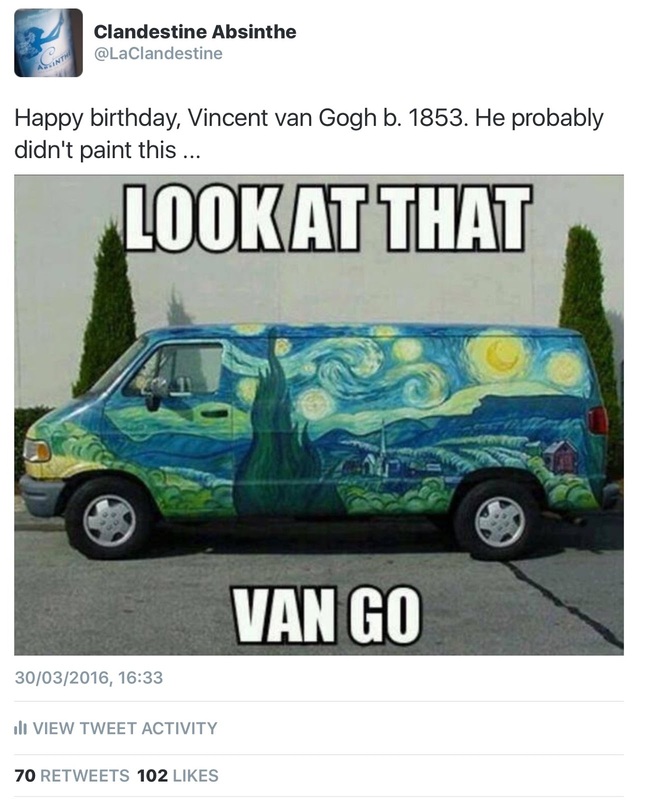 Do you like the name "Absinthe On the Gogh" which reverses the pun in the picture at the top? Absinthe To Gogh wouldn't work in bars: bartenders don't want their customers to go! Do you have any other comments or questions? Any other names? There is one issue we know about with this name. In England, Van Gogh's last name sounds similar to Goth. But given the affinity between Goths and absinthe, maybe that's OK. Some have commented that my distiller looks like a goth ... or should that be a Gogh?! Remember to comment below, please. Santé! 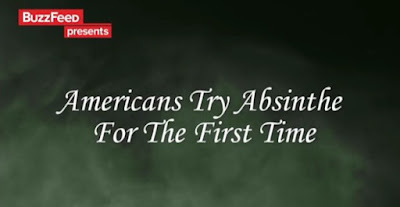 On August 4th, 2015, many absinthe lovers were quite dismissive of a new video which appeared on BuzzFeed that day: "Americans try Absinthe for the First Time." Initial comments included: "Just silly, "Makes us Americans look like idiots," "It boggles my mind to believe that people STILL believe that absinthe makes you "TRIP" balls .."
Then the comments changed to "Well, at least they prepared it properly and used actual absinthe," and recognition of how BuzzFeed works: "If it isn't ridiculous then BuzzFeed doesn't want it. Hipsters pretending to trip ballz on just alcohol generates views, education does not." Here are the rest of the Top Five YouTube absinthe videos. They are here for completion only, and I don't recommend wasting too much time watching them (apart from the absinthe glass drawing video). A video for IOS Jailbreak software. Nothing to do with real absinthe. 1.4 million views. The absinthe effect. Nothing to do with real absinthe, this video just shows the effect of being very drunk. 1.2 million views. How I drew an absinthe glass. 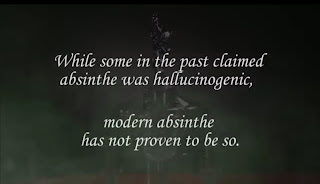 At last a good video that is partly about absinthe. Also 1.2 million views. Shoenice slams absinthe. Showing how to drink a whole bottle of Lucid Absinthe at one go. Just under 1.2 million views. a) Sadly there doesn't seem to be any great interest in good educational videos for real absinthe. 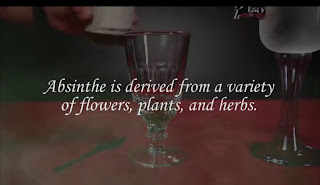 There are some educational videos further down the top 20 list, but most of them choose products that absinthe connoisseurs would not recognise as real absinthe and one includes the burning option. b) It is all too easy to associate drinking absinthe with getting drunk or "other" effects. The BuzzFeed video's stars are either claiming to experience those "other" effects, or are actually experiencing placebo effects. Entertaining, perhaps, but not very educational or informative. At least it is not focused on watching people getting drunk! c) Viewing all five videos, and then reading the comments underneath the BuzzFeed video, there remains an enormous, ongoing need for education about absinthe. What it is, what it does and how to drink it. Ignoring the video's humorous elements, BuzzFeed clearly shows how to drink it. With chilled water (3 - 5 parts). The fountain is optional: a decanter or carafe can work just as well. Maybe with a sugar cube, although a lot of good absinthes do not need any sugar. Not as a shot, and definitely not burnt. There is NO difference between absinthe in the past and "modern absinthe," except for the fact that some "bath-tub absinthe" made in the 19th century may have been poisonous! BuzzFeed makes one very good point, maybe without realising it. It chose two absinthes in smaller (200 ml) bottles for its video: La Clandestine and St. George. Smaller bottles are an ideal way to try absinthes for the first time before committing to a full bottle purchase. In fact smaller bottles may also be a good way for some bars to start with absinthes (especially if they want to offer a broader range or if they expect a lot of their absinthe to be used in dashes or rinses). BuzzFeed shows people socialising and having fun with absinthe, hints at its naughtier side, but also illustrates the issues and opportunities for absinthe. BuzzFeed videos are produced in Los Angeles, and it seems rather surprising that none of the cast have tried absinthe before. If the characters in this video (trendy, well-off Californians) really are trying absinthe for the first time, then absinthe companies have some way to go to create trial and interest. I find the comments beneath the BuzzFeed video to be of greater concern (current ignorance) and to highlight the opportunities (overcoming ignorance will attract and keep tomorrow's consumers). There continues to be a lot of misunderstanding about absinthe, but BuzzFeed has helped to correct some of that. For those of us in the absinthe sector (making, marketing, selling absinthe), the need for education continues. Bars and retailers serving and selling absinthe correctly will do a lot to address the ongoing ignorance about the category. I would love it if BuzzFeed had made an even better educational video, but their film is, in overall terms, a positive for the category. 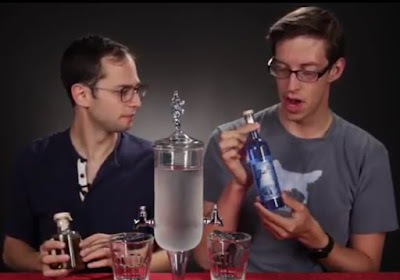 I'm pleased that BuzzFeed chose 200 ml bottles for the video (La Clandestine and St. George): they are a great way to try an absinthe for the first time. 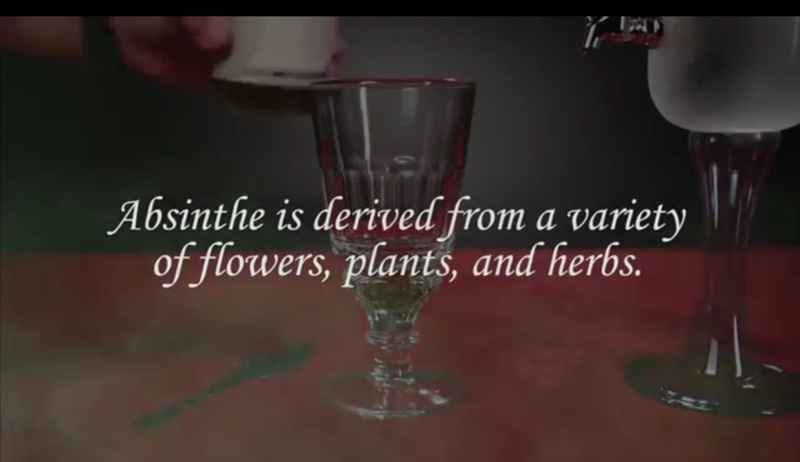 Finally, an absinthe video that is a little more educational. I've pulled together a collection of photos (taken by Peter Wilhelm) showing the wonderful 2015 Grande Wormwood harvest featuring a top wormwood grower, Yves Currit and several absinthe makers, including Claude-Alain Bugnon. 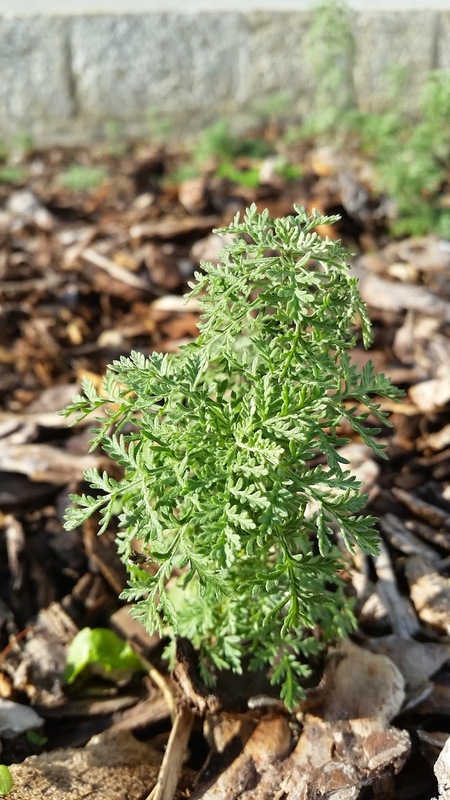 The wormwood is now being dried (see the last few photos) and the absinthe will be available in 2016 should BuzzFeed be ready for another video about absinthe! Got tight last night on absinthe and did knife tricks. Great success shooting the knife into the piano. The woodworms are so bad and eat hell out of all furniture that you can always claim the woodworms did it. The similarity between woodworm and wormwood is, of course, intentional. He is also credited with the creation of the Death in the Afternoon cocktail, of which more later. With July being both the anniversary of his birth (116 years ago today on July 21, 1899) and his death (July 2, 1961), it seems an appropriate time to dig a little deeper into Hemingway and absinthe. And the best place to start was with Philip Greene, author of the book shown above: the key book for students of Hemingway and cocktails (and one which I warmly recommend). I was fortunate to be at Philip's seminar at Tales of the Cocktail in 2013, and have corresponded and Skyped with him more recently. Given that absinthe was illegal in the US when Hemingway would have been of drinking age, and that it was illegal in France once Hemingway moved there, I asked Philip where Hemingway would have been exposed to absinthe. The first time appears to have been when he was a journalist working for The Toronto Star and wrote about the Great Aperitif Scandal in Paris in an article published on August 12, 1922. The full article is online here. This is historically very interesting since it is one of the few contemporaneous records of moonshine absinthe made, sold and enjoyed in Paris after the 1915 ban. I then asked about Hemingway's exposure to absinthe as a drinker living in Paris. Some of this is clearly reflected in his first novel. While in Paris, Hemingway moved in creative circles, including Picasso, James Joyce with whom Hemingway frequently embarked on "alcoholic sprees," and F. Scott Fitzgerald who inspired him to write his first novel. On his birthday in 1925 (90 years ago today), Hemingway started writing The Sun Also Rises, and this includes many references to absinthe and/or Pernod being enjoyed in both Paris and Spain. Of course absinthe was legal in Spain and illegal in France, so the references (which would have been at least partially based on Hemingway's encounters with absinthe) are quite illuminating. Hemingway is claimed to have been to so many bars in Europe that there is even a bar in Madrid called “Hemingway never drank here!” In Paris he drank at Harry's New York Bar, The Ritz, and many other top hotel bars (who may not have served absinthe openly after the ban), but in The Sun Also Rises the most notable encounters with absinthe are at Café Napolitain and Closerie des Lilas where absinthe/Pernod are enjoyed quite openly. Both these bars were real bars that still exist today. One wonders whether these bars would have served absinthe to Hemingway and others as openly as they seem to in the book. Philip believes absinthe would have been served more discretely, and I would tend to agree. 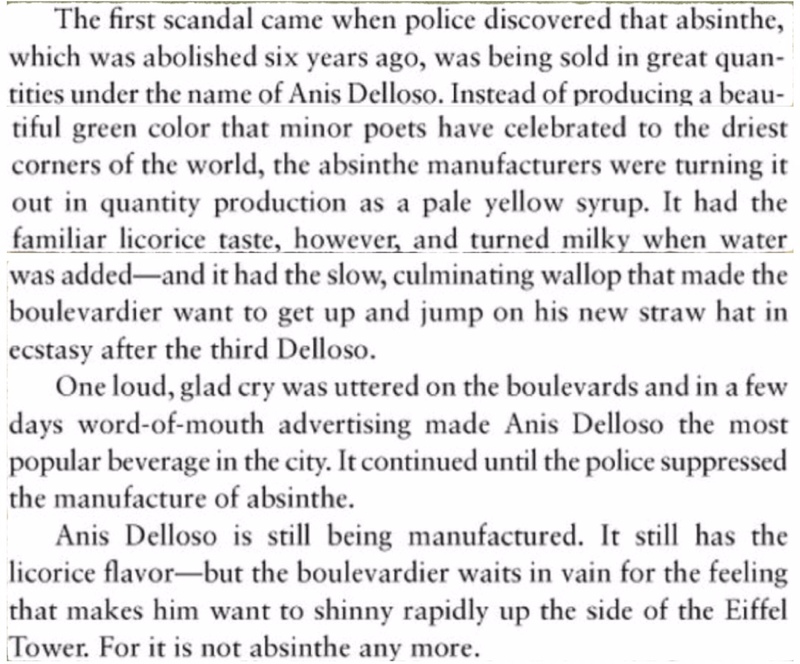 Were these bars selling real absinthe circa 1925? Pernod is described in the book as being "greenish imitation absinthe," which might sound like pastis. But pastis was not launched in France until the 1930's. Maybe the Pernod Hemingway writes about was a fake? And when Hemingway writes "Pernod" in The Sun also Rises, it also seems possible that the word is being used as a generic, rather than the brand (when not at the start of a sentence, Pernod is always written here with a small "p"). 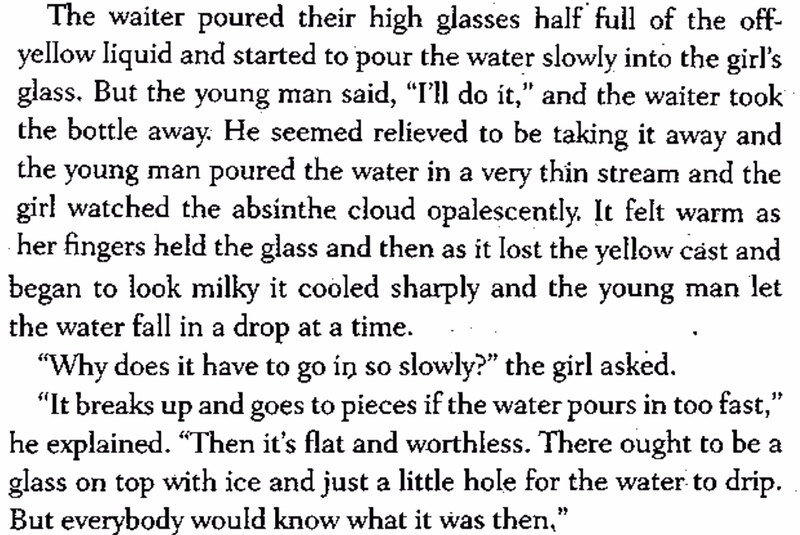 As for Hemingway's own experiences of absinthe, maybe they are reflected in his writings? "I was drunker than I had ever been ... the room was unstable unless I looked at some fixed point ... I .. lay on the bed. The bed went sailing off." .... "The world was not wheeling any more. It was just very clear and bright, and inclined to blur at the edges." Of course these descriptions may not be much more than average drunkenness but the description "very clear and bright" seems to go beyond that, and may seem familiar for some absinthe drinkers. "He would wait for her and have a drink out on the terrace after his work. It was impossible to drink pastis after absinthe and he had taken to drinking whiskey and Perrier water." "Impossible to drink pastis after absinthe?" 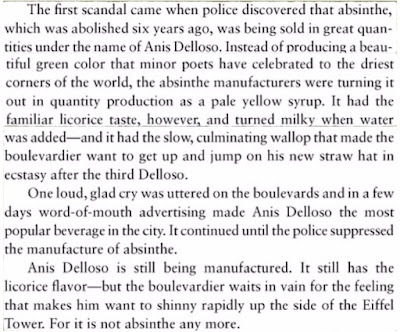 The context makes it clear that, in Hemingway's opinion, absinthe drinkers would not be satisfied with pastis. A sentiment that must be interesting for those companies that produce both absinthe and pastis! After living in Paris, Hemingway moved back to the USA (Florida), then to Cuba and finally back to the USA again (Idaho). He is known to have had absinthe while living in Key West and may well have had absinthe in Cuba, although there is no surviving evidence of that. Hemingway loved champagne and absinthe, as well as rum, but some doubt whether he would really have liked the idea of mixing champagne and absinthe. Views of the cocktail are sometimes polarised among absinthe lovers, and champagne lovers may be even less positive! Read a little more on the Death in the Afternoon (and my variant) in the second half of this article. 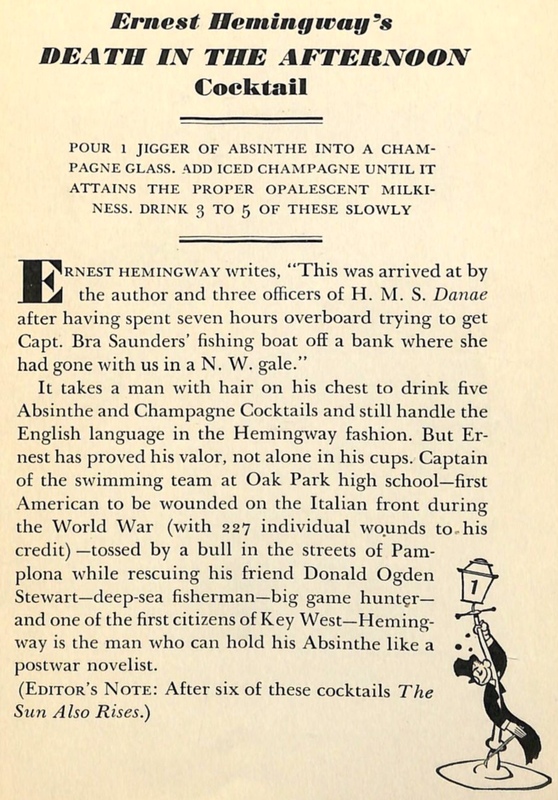 In all the rest of Hemingway's writings published to date, there are no ways to drink absinthe other than the classic serve (Hemingway did not use a sugar cube) and the Death in the Afternoon. He created other cocktails (e.g. Death in the Gulf Stream with Genever, lime juice, simple syrup, Angostura bitters and zest of lime), and was known to drink many other cocktails (especially those with rum). He frequented many of the world's top bars (including London's Savoy and The Ritz, and Havana's Bar La Floridita) and would surely have met the inventors of the Corpse Reviver 2, the Monkey Gland, and other famous absinthe cocktails, but seems to have never mentioned these or any other way of enjoying absinthe. I asked Philip if Hemingway might have enjoyed absinthe any other way, and he confirmed that while he knows of none, Hemingway's letters MAY include others. His letters are released on a "drip-feed" basis every few years in "Selected Letters;" more might therefore appear in the future. 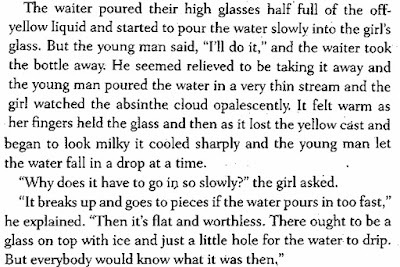 For now, however, Hemingway's absinthe drinking is like many of the drink's biggest fans: the traditional, drip serve only (with the one exception of the Death in the Afternoon). I had wanted to find evidence of Hemingway as an adventurer within absinthe as in his life, but instead I found him to be respectful of absinthe and of its traditions (even if he may have over-indulged a few times). Maybe his respect is partially due to absinthe's legal status in the USA and France at the time. And maybe he really was a purist at heart. I suspect, however, that Hemingway might have enjoyed The Old Man and the Sea, a new absinthe and champagne cocktail inspired, in part, by The Death in the Afternoon. Developed by our friend, Dave Whitehead, at Melbourne's Polly Cocktail Bar as part of their Hemingway celebrations this week. Cheers, Dave! And thanks for your help, Philip.You've chosen a fascinating subject to specialise in. Cheers! Salud! For the last year or so, my bartender presentations on absinthe have included much more about the role of absinthe in cocktails. Absinthe was first distilled commercially in 1798 (in Couvet, Switzerland) and 1798 is also the year that the word "cocktail" first appeared in print meaning a drink. Absinthe and cocktails seem to have been "paired at birth." 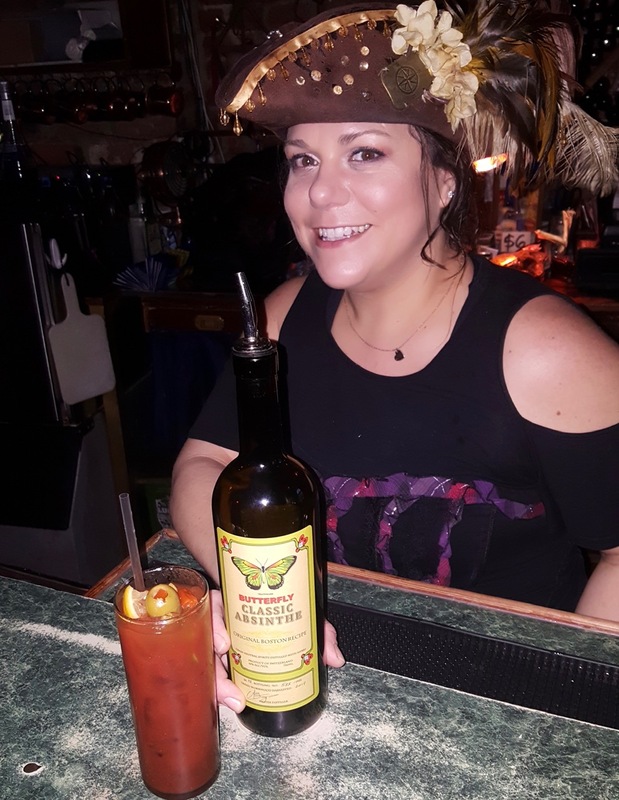 Around the world, bartenders now seem to realize that a lot of the old stories and ways of drinking absinthe were myths and fabrications to prey on the ignorant. But some bartenders still don't seem to know what to do with absinthe (apart from rinses in Sazeracs and dashes in Corpse Revivers, that is). 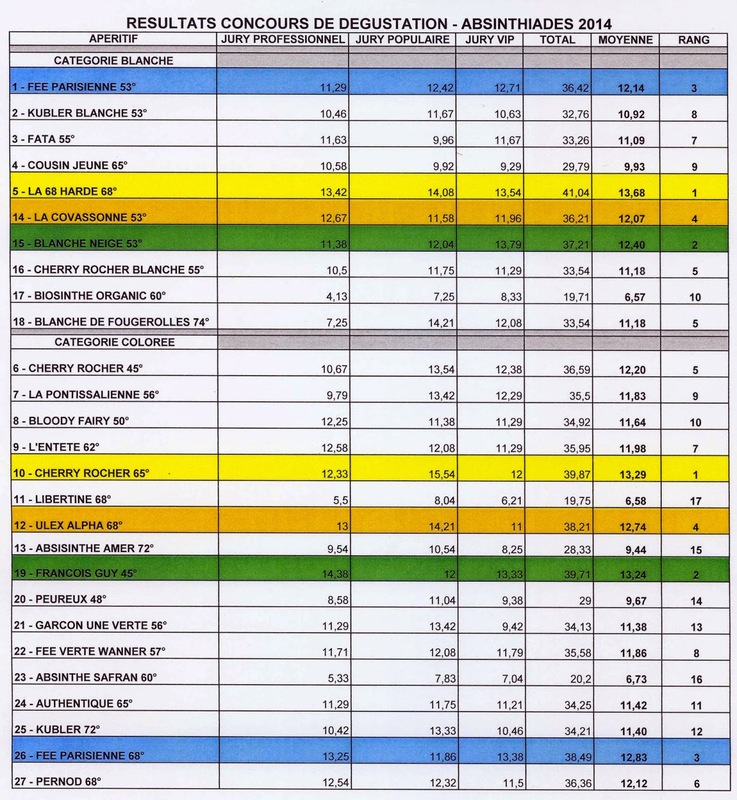 The first column of numbers shows the % of absinthe cocktails which used specific other ingredients in The Savoy in 1930. Not surprisingly absinthe was used in a lot of cocktails with gin and/or vermouth. The second column of numbers is based on the best absinthe cocktails book, A Taste for Absinthe, published in 2010, with cocktails provided by many of the world's best bartenders. Gin and vermouth have slipped down the list, and lemon/lime along with sugar or simple syrup have become the most popular ingredients to be paired with absinthe in cocktails. Interestingly both La Clandestine and Pernod are working extensively with cocktails made almost entirely with absinthe, limes and sugar. The Clandestino was first made in 2007 and The Green Beast was first made about three years later. So why was I at the Larder House? Here there was a team of contestants who were not thinking of the 1930 or even of 2010. They were thinking of creating the next great absinthe cocktail. Their brief was to use a full measure of absinthe, either La Clandestine or Butterfly, in creating their own new cocktail, and here is what they created and what I had the pleasure of judging .. I loved the way that David took elements from Butterfly's past: especially the fact that the owner of Dempsey, Boston, was one of the major US players fighting the threat of prohibition. Beautifully made with some great ingredients; excellently presented. The foam was an interesting challenge for a judge; of course one has to taste through it too, in order to understand how the taste of the cocktail will develop. The one small issue I had with this cocktail was the name which didn't quite communicate how wonderful this cocktail was. Pour all ingredients into iced filled absinthe fountain. Add 25ml La Clandestine Absinthe into Absinthe glass. Turn taps and add desired amount of apple and beet mix to absinthe. Garnish with Swiss mountain flowers. I had met Joel previously and, honestly, I didn't want him to win if he seemed to have any inside advantage! But I couldn't fault the concept or the final presentation and taste. Absinthe and beetroot do work together well, both visually and in a cocktail. It wasn't the punchiest of names for a cocktail but apart from that, it was faultless. So I chose two winners: Joel (for the best cocktail with La Clandestine) and Thomas (for the best cocktail with Butterfly). And I was delighted that Salvatore chose another winner, David, for the Bournemouth Bartenders League prize. It was a great day for me, in which I learnt a lot about the process of creating cocktails: from naming, through to preparation and execution. Thank you to the Bournemouth Bartenders League, thank you to Matt Pollard for the photographs (hopefully my collages did not spoil them too much! ),and above all thanks to Salvatore for organising it all. It is clear that great absinthe cocktails can be made with much more than a few drops or dashes as used by Craddock in 1930. If this happens elsewhere, absinthe distillers will be very busy keeping up with demand in the near future! The first weekend in October? It must be time for the Absinthiades, the annual absinthe festival in Pontarlier, France. Sadly I couldn't go (the following week was already hectic enough with the Bar Convent Berlin and the London Cocktail Week). But as we say in England, every cloud (we have a lot here) has a silver lining since my absence provides me an opportunity to have a guest writer, Maxime Ruby. Maxime has his own excellent absinthe blog and who has just started a new French Absinthe Forum. I am delighted to bring you his interview with Philippe Chapon, the president of the organisers of the Absinthiades. It is in French but Google Translate copes with it well. Cette année c’est sous le soleil de Franche comté que ce sont déroulées les 14èmes absinthiades à Pontarlier ; l’occasion, cette fois encore de se rassembler autour de l’absinthe et de rencontrer des passionnées de tout horizon pendant un week-end. 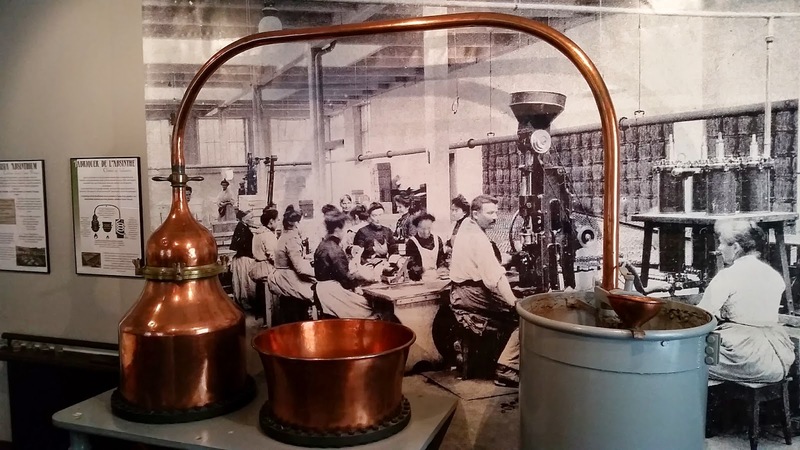 Visites de musée, des distilleries, rencontres avec des collectionneurs, des auteurs, dégustations, les activités ne manques pas pendant la manifestation. Cette année j’en ai profité pour poser quelques questions à Philippe Chapon, le président de l’association des amis du musée de Pontarlier, organisatrice de l’évènement. 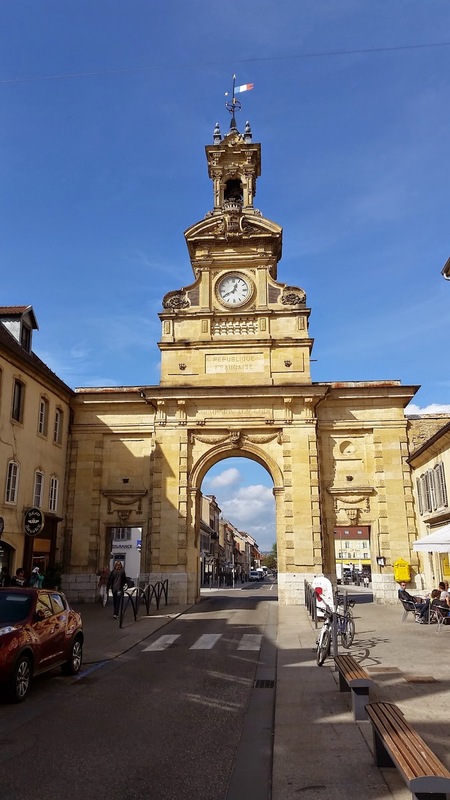 Comment est née l’association des amis du musée de Pontarlier ? L’association a été créé en 1983, à l’époque il n’y avait pas encore de musée, on était en pleine réorganisation du musée municipale et l’on était plus autour de la peinture franc-comtoise et l’archéologie. Nous avions quelques objets sur l’absinthe mais très peu. Et puis avec le temps nous avons eu quelques donateurs et cette association permettait aux gens de donner, car on ne pouvait pas donner directement au musée. Aujourd’hui, si cette association était dissoute, tout ce qu’elle a pu acquérir serait reverser au musé de Pontarlier. Donc c’est vraiment, au départ, une association crée pour recevoir les dons. L’absinthe est ressortie des placards petit à petit même si elle était dans la mémoire des gens, mais il faut reconnaitre qu’il n’y avait pas la même implication qu’en Suisse. On buvait de l’absinthe mais elle venait plutôt du val-de-Travers. On avait bien quelques personnes à Pontarlier ou aux alentours qui distillaient mais ça n’était pas aussi organisé qu’en Suisse. Depuis 1983, il y a eu trois présidents de cette association, je suis donc le troisième. Comment a commencé l’aventure des absinthiades? avec des objets des collectionneurs, des auteurs ; et le public est là c’est un succès. Dès la deuxième édition on introduit le premier concours avec une dizaine d’absinthes, surtout des macérés et très peu de distillées, pas d’absinthe suisse jusqu’en 2005. Aujourd’hui nous sommes à la 14ème édition et donc à la 13eme édition du concours ; les Absinthes Suisse sont là depuis la légalisation en 2005, les deux premiers qui ont accepté de venir sont Kubler et Claude Alain Bugnon qui à l’époque a créé un produit spécialement pour la France du aux règlementations différents sur le taux de frenchonne entre la France et la Suisse ; il avait donc crée la recette « Marianne » adaptée au marché français. 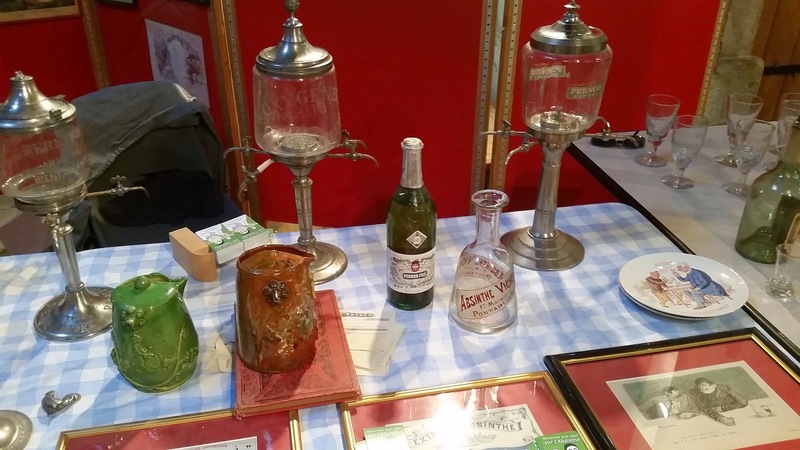 C’était également une volonté d’introduire l’absinthe Suisse sur la Marché Français. le Pays de l’absinthe avec cette route de l’absinthe […] aujourd’hui les absinthiades sont une des manifestations importante de cette route de l’absinthe, et j’espère qu’il y en aura d’autres. Ça fait environ une quinzaine d’années que l’absinthe est réapparue sur le marché Français, pensez-vous que l’absinthe est en phase de se « repopulariser » ? Comment se sont déroulées les absinthiades de cette année de votre point de vue ? Ça se passe bien, puisque depuis vendredi soir il y a du monde. Il y a du passage sur les différents sites que ce soit à l’exposition, au musée, à la chapelle. Hier nous aurions pu doubler le jury populaire, beaucoup de gens se proposaient en cas de désistement, donc c’est un moment fort, peut-être que pour les 15ème on doublera le nombre de participants. Moi ce qui me plait toujours c’est qu’il y a qu’il y a des gens qui viennent de partout, des quatre coin de France mais aussi des tchèques, un journaliste allemand, un japonais, des finlandais. 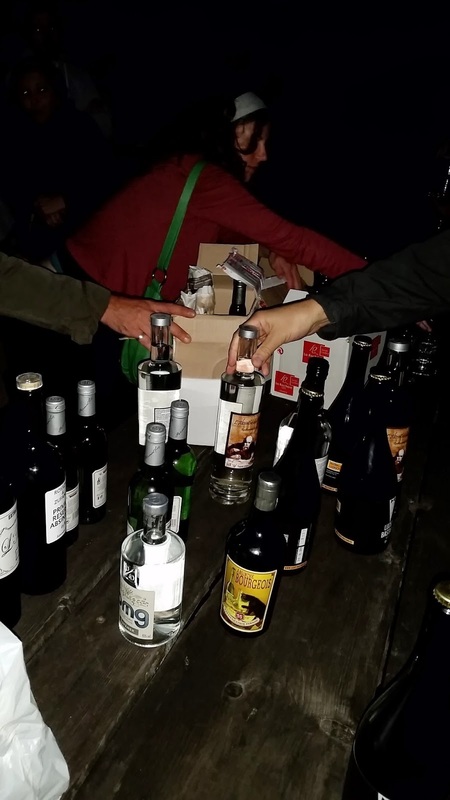 L’idée c’est ça, que les gens viennent, se rencontrent ; distillateurs, amateurs, bloggeurs, absintheurs peu importe comme ils se définissent, que les gens viennent pendant ce week-end et que pendant 2 jours ça vive, et je pense que la-dessus l’objectif est rempli. L’année prochaine, nous serons en 2015, cela fera un siècle que l’absinthe a été interdite en France. Est-ce que vous prévoyez quelque chose de spécial pour l’occasion? Oui, on essaiera de booster un peu cette manifestation, de faire quelque choses d’original pour le centenaire. Ensuite les choses restent à définir, mais c’est bien notre idée. Mais il ya aussi une question de moyens financiers, c’est parfois difficile d’inviter des gens, de payer les transports et les hébergements et tout ce qui va avec. Dernière question, que souhaiteriez-vous faire passer comme message aux personnes qui ne connaissent pas l’absinthe, pour essayer de les inciter à s’y intéresser? Ah, c’est une bonne question. Déjà aller sur des blogs comme celui-ci, de s’intéresser aux lieux où les gens discutent sur internet, même si parfois on a pu avoir des critiques un peu dures sur les absinthiades ou sur les produits présentés, même si nous tentons d’être le plus rigoureux possible sur les méthodes de choix et de déroulement du concours. A travers ce qui se passe sur internet, quand par exemple les gens parlent d’un bouquin de benoit Noel ou lorsqu’ils découvrent une nouvelle bouteille, je souhaite puis qu’ils aient envie de voir ou ça se passe, d’où ça vient, qu’ils découvrent le jura, qu’ils passent en suisse ; lorsque les touristes viennent dans le jura, ils le disent : « c’est beau » ; et puis ils peuvent découvrir plein de choses y compris ce produit. Mais lorsqu’on parle de la région, on peut se dire « des montagnes, il y en a partout, du fromage, il y en a partout, des salaisons, de la neige, c’est pareil » le Jura est une montagne parmi les autres ; mais cette Absinthe… il n’y a que nous, le Jura franco-Suisse. a hitherto unknown blanche (La Harde 68) and a surprising verte (Cherry Rocher). Again the Absinthiades produced a controversial result, which will no doubt be discussed elsewhere! Next year sees the 15th Absinthiades. If you haven't visited this before, then maybe it's time to go in 2015. Merci, Philippe. Et merci, Maxime. "A cocktail is much improved by the addition of two or three drops of Absinthe." The Mixicologist also contains the famous quote about absinthe in the title of this post: "A cocktail is much improved by the addition of two or three drops of Absinthe." Of course Lawlor's Suissesse contains far more than two or three drops, so don't feel limited by the quote! From time to time, I come across bartenders who are not fully convinced about absinthe. 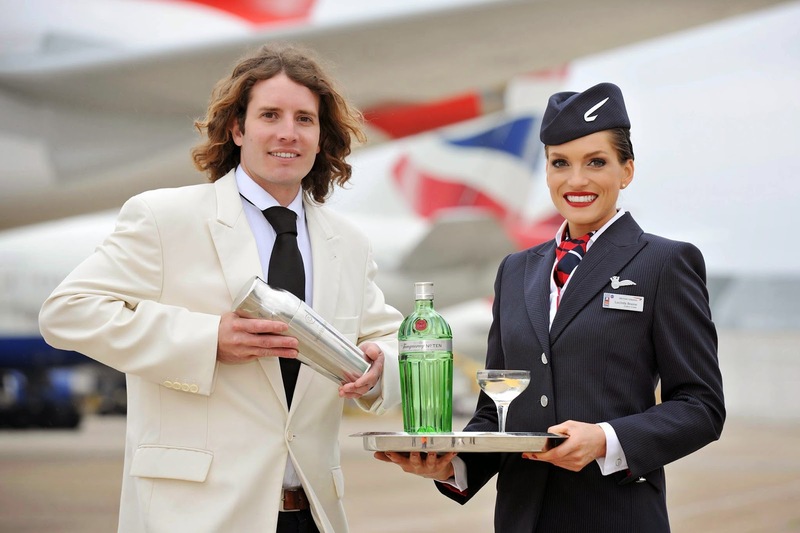 In some cases, that seems to be down to bad experiences bartenders have had with absinthe in the past, and that seems to be especially true in markets where the Czech-style of "absinth" appeared before the real absinthe that is now more globally dominant. Or they see that absinthe is burnt and/or shot in other bars, and they don't want to encourage practices like that in their own bar. So how can I convince bartenders and those making cocktails at home that absinthe can add so much to a cocktail? By quoting Lawlor and Regan? Well, that's one way, but "theory" is not as effective as "practice." And over the last month I have seen two great examples of world class practice (literally "World Class"), using absinthe in cocktails that have helped their creators win two of the top prizes in the cocktail world globally. 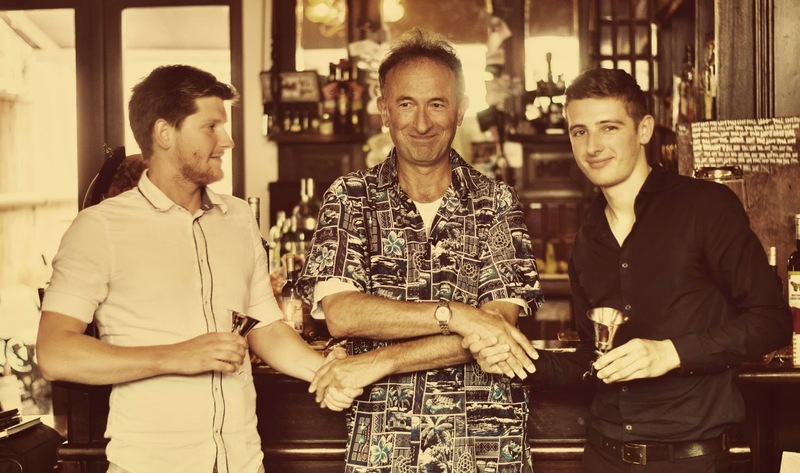 I have written previously about the Maid in Cuba cocktail created by Tom Walker at The Savoy for the Bacardi Legacy competition. As Tom said, the inclusion of absinthe makes this a more mature and more interesting alternative to the mojito and the daiquiri, the main drinks which helped inspire the Maid in Cuba, and the audience certainly enjoyed the cocktail at our "Savoy's Green Fairy Secrets" seminar at Tales of the Cocktail 2013. Tom is a highly motivated, detail-obsessed bartender and maybe his time at the Savoy has given him a special understanding of absinthe. However Tom is definitely not unique in appreciating what absinthe can do for cocktails. Today after a week of competition in London and in Hong Kong, the UK winner of the Diageo World Class competition was announced. 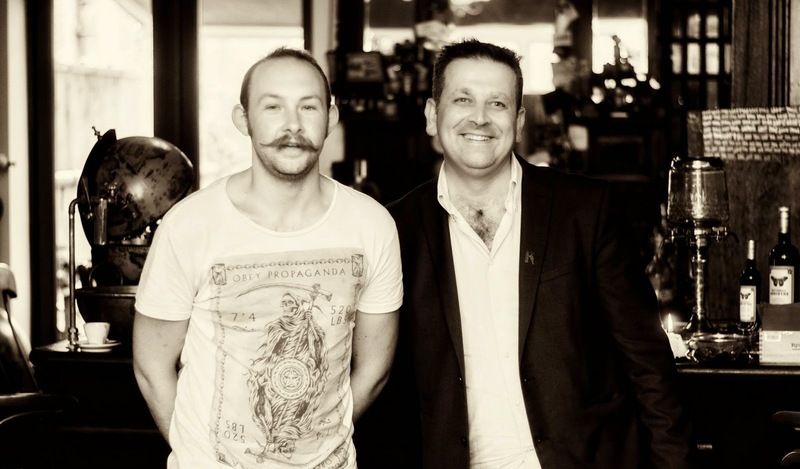 James Fowler of The Larder House, Southbourne (near Bournemouth) has been a long-term fan of good absinthes, and hosted our first Absinthe Dinner at The Larder House on Valentine's Day, 2012. Later that year, he and Joel Solomon came to Boveresse for the world's largest Absinthe Festival. James told me that he uses as much absinthe as vodka in his restaurant and bar, a fascinating statistic, especially given that it is not positioned as an absinthe outlet. Stir with bar spoon to chill & dilute. 50 revolutions. 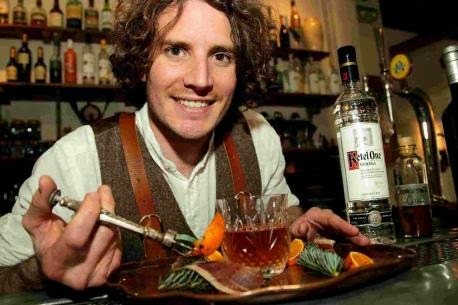 Over the course of a whole week in London and Hong Kong, James and the other finalists had to do far more than just preparing one cocktail (e.g. food pairing), but this speciality cocktail was a key element in James progressing to the later stages. James shows a keen appreciation of what absinthe can bring to cocktails (as well as to food), even if only in dashes. Congratulations, James! If you're a bartender and don't currently use good absinthe, maybe you could consider why do all these top bars (and many more) make such good use of absinthe. If you make cocktails at home and don't have absinthe, well, it's almost like being a cook without having salt and pepper. Congratulations to Tom and James! Good luck to all the nominees at Tales of the Cocktail! And to all future potential prize-winners and those of you striving to make great cocktails at home!